Sparkling red wine made using méthode champenoise. 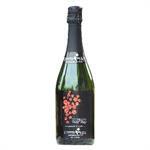 Sparkling Chambourcin showcases fruity and berry characteristics. Please Note: We cannot ship sparkling wines outside of Pennsylvania. Sparkling white wine made using méthode champenoise. Sparkling Vidal has crisp flavors of lemon and grapefruit with soft, yeasty undertones. Please Note: We cannot ship sparkling wines outside of Pennsylvania. Sparkling white wine made using méthode champenoise. Sparkling Cayuga White is full of fresh grape characteristics and a soft, smooth finish. Please Note: We cannot ship sparkling wines outside of Pennsylvania.